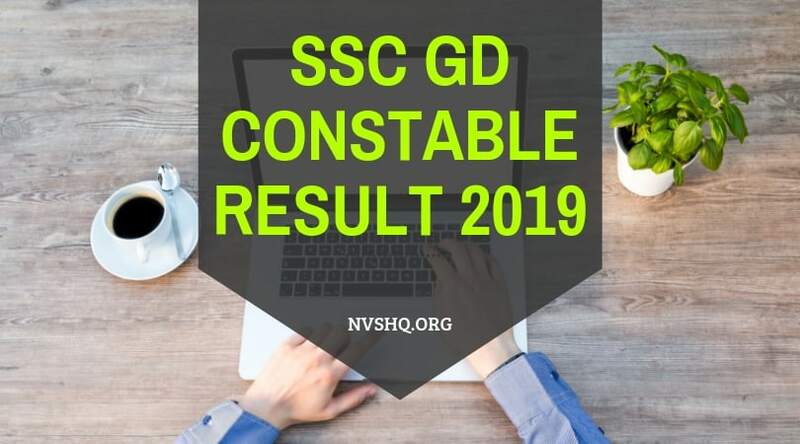 SSC GD Constable Result 2019 and Merit list/Cut-off marks: Staff Selection Commission (SSC) the authority responsible for conducting this exam, recently in a notice announced the tentative date for Constable GD result. SSC GD constable result for Computer Based Examination is scheduled to be released tentatively on 31st May 2019. Final dates will be updated soon. SSC GD Result 2019 will be published on official website as SSC GD merit list/ select list. No hard copy of result will be send to candidates through post. Candidates shortlisted in CBE will be invited for Physical Efficiency Test. 3.1 How to check SSC GD Constable Result 2019? SSC has also increased the number of vacancies from 54953 to 58,373 which is a good news for candidates who have appeared for the test. As the official notification, the number of candidates shortlisted for PET after CBE will be 10 nearly times the number of vacancies. For more details related to SSC GD constable result, candidates can scroll down and go through the complete article. Before the release of result, Commission will publish the tentative answer keys to all the question paper sets. Answer keys will be published on official SSC website in PDF form. It is expected to the release in the third week of April 2019. Answer sheets provides an insight about the performance and result of the candidates. After the release of provisional answer keys, candidates will be given a chance to submit representation against the tentative answer key. Candidates should submit their representation within the stipulated time-frame. Candidates will be notified through the official website. After the analysis of representation filed, a final answer key will be prepared and released. No further objections in this regards will be accepted. Once the final answer key is released, SSC will also publish the result/merit list. 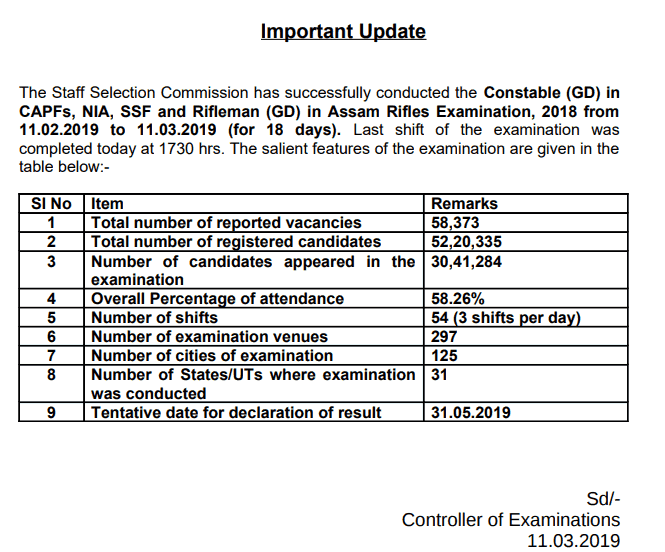 Computer Based Examination for the recruitment of Constable (GD) in various forces and Riflemen (GD) in Assam Rifle was held from 11th Feb to 11th March for 18 days in multiple shifts in various exam centres established across the country. It was an online exam (Computer Based Examination). There were four parts in the question paper viz. Part A (General Intelligence and Reasoning), Part B (General Knowledge and General Awareness), Part C (Elementary Mathematics) and Part D (English/ Hindi). Objective type questions were asked. Total number of questions was 100. Shortlisting of candidates for next selection round will be done on the basis of normalization of marks scored in the test. The medium of exam was English and Hindi. How to check SSC GD Constable Result 2019? Result will be published through the online mode. Candidates have to download their result from the official website. To assist the candidates in downloading the result from the official portal, we have shared an easy procedure by which they can get their result online. Candidates have to start by opening the official website of SSC (mentioned above). They can also access the result directly from the link shared on this page. On the homepage of the website, candidates have to click on the relevant result PDF provided under the section “Latest News”. On clicking on the relevant PDF link, SSC Constable GD result will appear on the screen in the form of PDF. Candidates have to find their names or roll number in the list under the zone from which they have applied. Once candidates have checked the result, they can also save it for future correspondence. They can download it by clicking on the download option. Names of the shortlisted candidates for PET (not necessarily in the order of merit), roll numbers of the candidates, region/zone, marks obtained, category, gender, instructions, etc. Candidates have to search their names according their zone/region. Only those candidates will be considered qualified whose names will be there in the select list. The merit list will be final for the CBE and no representation or objection against the same will be entertained under any circumstances. Cut-Off marks is the very important factor that helps in preparation of result and merit list. The minimum marks that a conduct requires to pass or qualify an exam is known as cut-off marks. Generally, for every exam cut-off marks varies as per the category of the candidates. 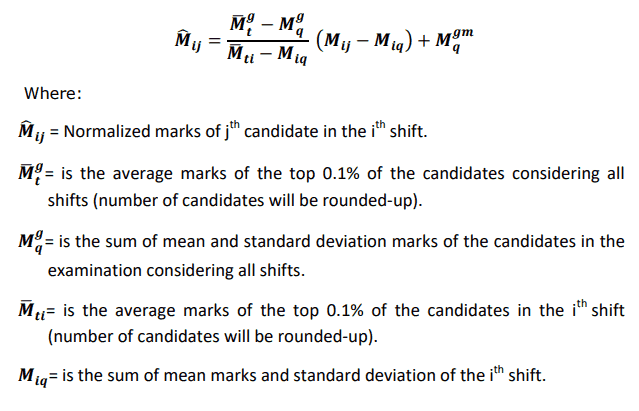 There are various factors on the basis of which cut-off marks are decided for each category of the candidates. These factors include number of candidates appearing for exam, number of vacancies, difficulty level of exam, marking scheme, reservation applicable, etc. Candidates scoring less than the cut-off marks in their respective category will not be shortlisted for next the round. (a) Total marks obtained in Computer Based Examination. It means candidate who will score more marks will be given preference. (b) Marks in Part-A of CBE. (c) Marks in Part-B of CBE. (d) Date of Birth, with older candidates, placed higher. Candidate older in age will be given priority. (e) Alphabetical order of names (starting with first name). For example, candidates whose name will start with “A” will be placed higher. As per the selection procedure specified by the commission, candidates qualifying the CBE will be shortlisted for next round i.e. PET (Physical Efficiency Test) followed by PST (Physical Standard Test) and Medical Examination. The names of the candidates shortlisted for PET will be mentioned in the merit list. The intimation regarding the PET date, admit card, date, time, test center and other details will be notified to candidates through official website, SMS/ Email. Therefore, all the shortlisted candidates should frequently visit the official portal for latest news updates related to PET. It will include a race. Male candidates have to cover a distance of 5 km in 24 minutes. Female candidates have to cover a distance of 1.6 km in 8 ½ minutes. Pregnant female candidates will be rejected at this stage. PET will not be conducted for Ex-Servicemen shortlisted after CBE. They only have to appear for measurement of height, weight and chest only in PST round. After completion of PET, shortlisted candidates have to appear for PST and further for Medical examination. SSC exam was conducted in multiple stage and for the smooth and transparent evaluation of the result, normalization of marks method will be used to prepare the merit list. In case of any query related to SSC GD constable result, candidates are free to share their queries with us. They can write any issue regarding this article through the comment section below. कब तक आयेगा एसएससी जीडी का आंसर की please reply immediately. Abhi koi fix date nhi pata h. Jaise hi answer key aaigi hum yaha update kar dege. Sath me bane rahiye. April third week m confirm h kya answer key aana.